Why not start February 14th off right with a Valentine's Day breakfast. 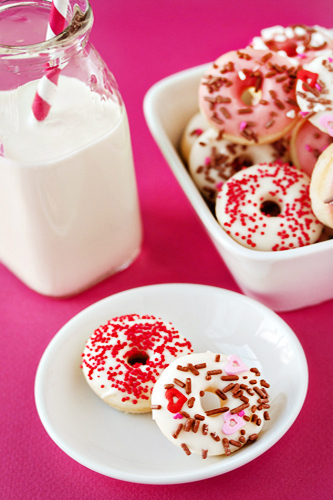 And if you are looking for something sweet, consider adding these Valentine mini donuts to the menu. You can get the recipe for these mini baked donuts over at My Baking Addiction. SO cute!! We're doing a whole 14 day countdown- these would be perfect! I'm your newest follower- thought I already was following you... weird!